Okay, so I'm embarrassed. Really. Almost as embarrassed as when in ninth grade I pulled out my English book in study hall and a feminine hygiene item came out with it and flew across the room. For real. So you know that little "Contact Us" tab at the top of the page? The one I thought no one ever used and almost deleted a few days ago? It turns out people DID use it, but I didn't know that because I had screwed up what e-mail account I had the contact forms sent to. Stupid, right? When I finally put together my mistake and checked, there were hundreds of e-mails. Hundreds! From the past several YEARS. They were full of questions about recipes, sweet compliments about the site, requests to use recipes/photos, etc. There were even sweet notes from people checking up on me when I was out for a few months with some pretty horrific morning sickness. And they all sat there, unanswered in my e-mail. I've spent a good part of the past few days trying to write back to the e-mails and apologize, but I'm starting to realize I might never get through them all so here is my awkward group apology. I'm sorry I left you all hanging. I love hearing from you and hope you weren't offended by my seeming lack of caring. I hope you still visit the site and hope you will still try to contact me again if you have questions. I promise it won't take me a year to respond this time. Okay, with that out of the way, let's talk about food. Yummy food. 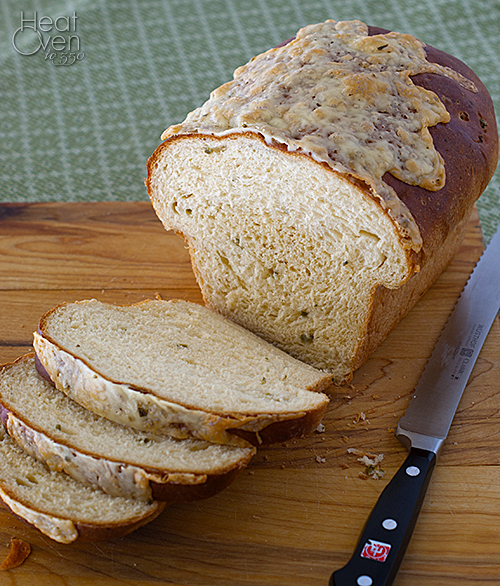 Like this jalapeno cheese bread. When I ran across this recipe in a little cookbook I bought on a whim I was hoping it would taste as good as it sounded. Bread recipes are often hit or miss, but this one is a huge hit. It's simply delicious. 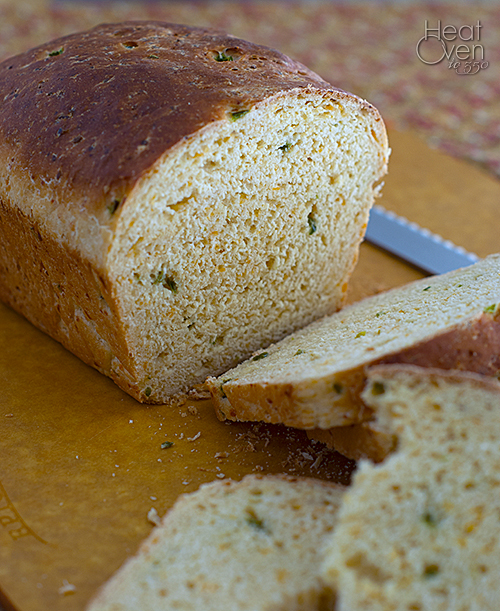 It is a nice, fluffy bread with plenty of jalapeno flavor and a great cheesy undertone. The taste reminds me a lot of pepperjack cheese. There isn't much heat that comes through, but the jalapeno flavor is definitely there. It tastes great with so many things, from a big bowl of chili to stew to a killer grilled cheese sandwich. After making it once my husband suggested melting some cheese on top while it was cooking to make it even cheesier. More cheese? Done. Combine yogurt, water, egg, 2 3/4 cups flour, baking soda, salt, sugar, cheese, peppers and yeast in the bowl of a standing mixer with a dough hook. Mix on a low speed until the ingredients are combined. Knead on a low speed for four minutes. If the dough hasn't formed a ball that is clearing the sides of the bowl while mixing, add more flour, 2 tablespoons at a time, until it forms a ball. Mix on a low speed for 4 more minutes. Remove dough from standing mixer and shape into a ball. Place in a large bowl sprayed with non-stick spray. Roll dough so that all sides are well greased. then cover with plastic wrap and place in a warm area. Let dough rise until double, about 1 hour to 1 1/2 hours. Punch dough down and shape into a loaf. Place in a greased 9x5 inch bread pan. Let rise for 30 minutes. Heat over to 350 degrees. 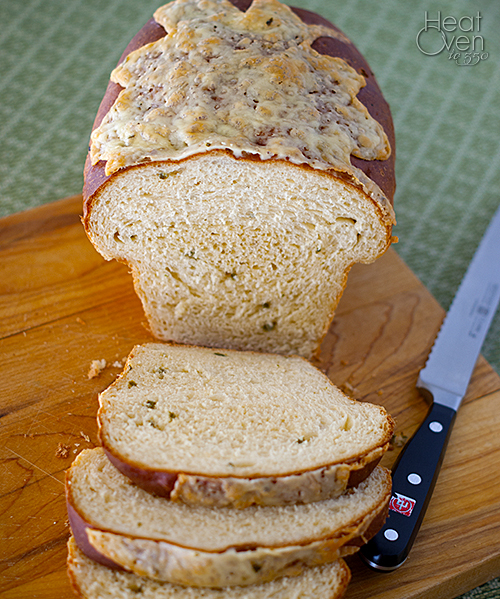 Bake bread for 30-35 minutes or until browned and cooked through. Sprinkle cheese on top of the loaf for the last 15 minutes of baking. Remove loaf from pan and let cool completely on a wire rack. Yum! What a perfect looking bread. I love your addition of cheese and jalapenos - perfect for spicing up a boring sandwich!